When you create an account, you will be able to access your personal trip information including confirmation, payments and additional tour information. The Inca Trail to Machu Picchu + Huaynapicchu Mountain is rated among the best trekking trips in the world because of the exquisite beauty of its natural surroundings; these include different ecological areas from high deserts to Andean Tropical rain forests. Following this ancient Inca Trail we will be walking past mysterious archaeological sites, half covered by jungle overgrowth, that look like you are discovering them for the first time, and finally arriving to the lost city of the Incas: Machu Picchu. This popular Peru tour is for those people who want to do the Classic Inca Trail trek and climb the Huaynapicchu or Machupicchu sacred mountains. Only the Peruvian Cultural Institute INC sells the Huaynapicchu or Machu Picchu permit combined with a Machu Picchu entrance. To get the best value from this purchase, you should stay the night in Aguas Calientes (Machupicchu pueblo) and re-visit Machu Picchu the next day, the beginning of that following day, hiking Huaynapicchu Mountain early; this way you get to enjoy Machu Picchu for an extra day (a walk to Inca bridge can complete this great experience). Trek the ancient Inca Trail in Peru to…Machu Picchu…for a trip of a life time! The Inca Trail is Peru’s best known hike, combining a stunning combination of Inca ruins, magnificent mountains and exotic vegetation. The trail goes over high mountain passes with unforgettable views, through the rainforest, and finally into subtropical vegetation. The legendary Inca Trail takes you through the diverse wilderness of the Machu Picchu UNESCO World Heritage Site, passing numerous Inca ruins on the magnificent stone highway before descending to the famed citadel of Machu Picchu. The 45 km trek is covered in 4 days, arriving at Machu Picchu at daybreak on the before returning to Cusco by train in the afternoon. The trek is rated moderate and any reasonably fit person will be able to cover the route. It is fairly challenging as you will be carrying your own personal belongings (porters carry group equipment including tents, stoves and food etc…). We climb to a maximum altitude of 4,200 m are reached. Please plan 2 full days in Cusco prior to commencing the trek. In Cusco, you will better acclimatize and have an opportunity to visit the city of Cusco and near by Inka ruins at Sacsayhuaman, Q’enko, Pucapucara and Tambomachay. 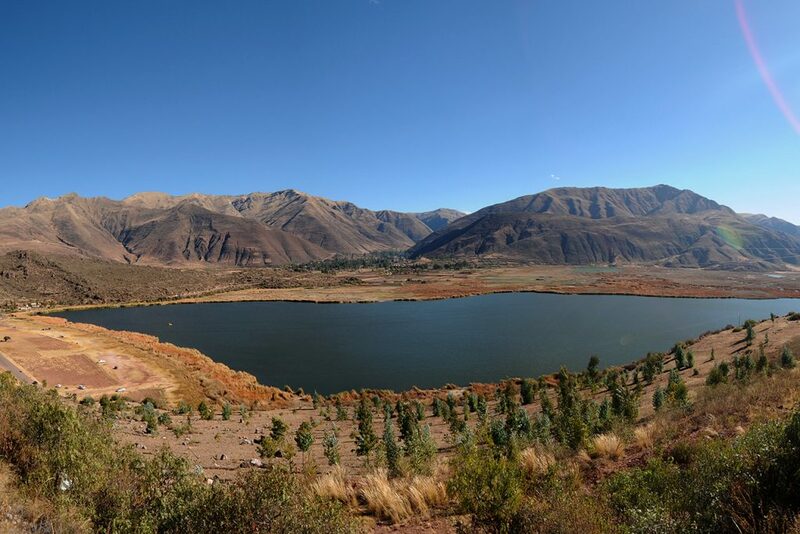 We pick you up at your hotel and travel by bus for a bit more than three hours, passing by the picturesque villages of Chinchero, Urubamba and Ollantaytambo, until reaching the kilometer 82, the start of the trail. From kilometer 82, we hike, along with native “Quechua” porters going through semi-arid terrain along the Urubamba River valley, with magnificent views of the snowcapped mountain, Veronica (5,822 meters). We cross the Vilcanota River and follow the trail to the right as it steeply climbs from the river. After passing through a small village, the ruins of the Inca hillfort of Huillca Raccay come into view high above the mouth of the river Cusichaca (“Happy Bridge”). It is then a simple descent down to the Cusichaca River. 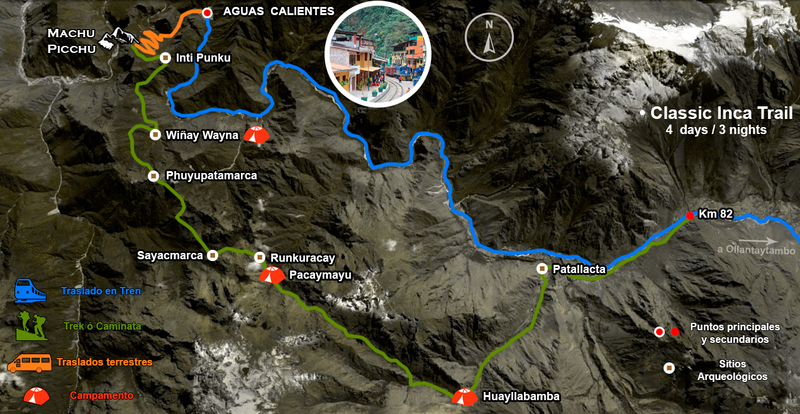 For a further 7 km the path follows the river to the village of Wayllabamba (3,000 meters). The name in Quechua means “Grassy plain”. We spend the first night here, beside spectacular ruins which we have time to explore. We cross the Vilcanota River and follow the trail to the right as it climbs steeply up from the river. After passing through a small village, the ruins of the Inca hillfort of Huillca Raccay come into view high above the mouth of the river Cusichaca (“Happy Bridge”). It is then a simple descent down to the Cusichaca River. For a further 7 km the path follows the left bank of the river up to the village of Wayllabamba (3,000 meters). The name in Quechua means “Grassy plain”. We spend the first night here beside some spectacular ruins which, if you have the energy, we have time to explore. After a delicious breakfast, we start our second day of hiking, perhaps the most difficult, as we climb to the pass of the impressive Warmihuañusca (“Dead woman’s Pass”, 4,200 m). 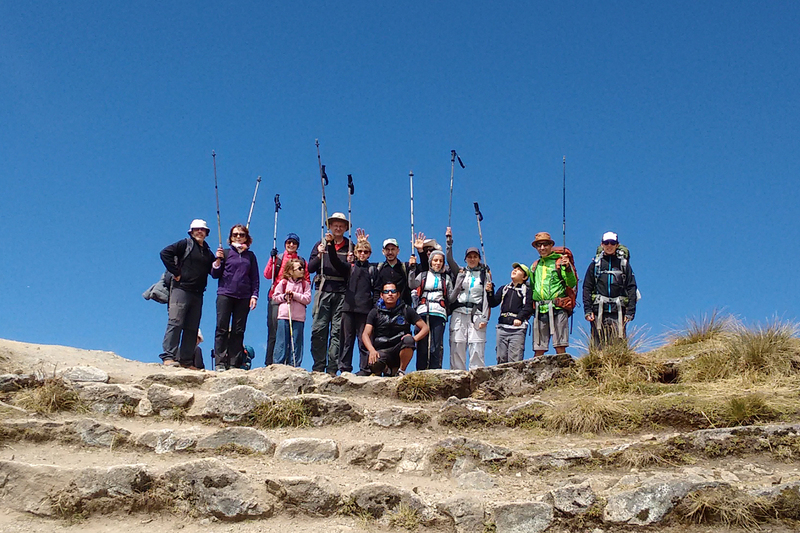 Warmihuańusca is the highest in the Inca Trail an offers a spectacular view of the Andes. The path continue, following a mountain stream, where we may see hummingbirds framed by the cloud forest. We pass by the beautiful grassy area at Llulluchapampa (3680 meters), which also boasts outstanding views down the valley. After lunch, we start the descent towards the valley of Pacaymayu, where we make our second camp. From Pacaymayu, we hike about an hour to climb up to the ruins of Runkuracay. These small circular ruins occupy a commanding position overlooking the Pacaymayu valley below. 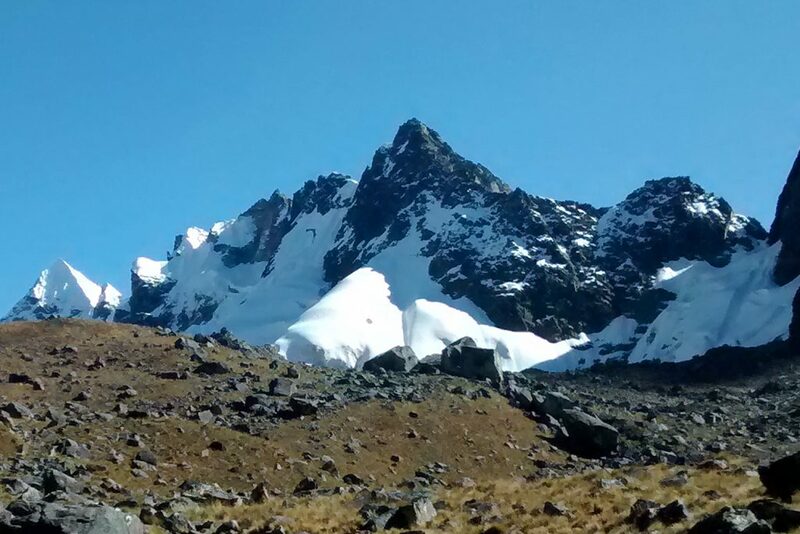 Another 45 minutes’ hike brings you to the top of the second pass: Abra de Runkuracay (4,000 meters). You’ll be transported in time, walking along the trail of the Incas with preserved Inca stones throughout this area of the trail. We have a steep descent along this part of the trail, though you will be rewarded with beautiful scenery of stone embankments and deep precipices. After about 1 hour from the 2nd of the 3 passes, we arrive at Sayacmarca (“Inaccessible Town”) by way of a superbly engineered stone staircase. The name describes the position of the ruins perfectly; protected on three sides by sheer cliffs. To this day, no one is certain of the exact purpose of these ruins. We rejoin the trail as it passes Conchamarca, a small Inca dwelling situated in the shadows of Sayacmarca, which was probably a Tambo for weary travelers on their way to Machu Picchu. After an early morning chance to catch the sunrise on the surrounding snowcapped mountains of Salcantay and Veronica, we say farewell to our porters. Our porters send us off with a traditional song an dance. Our final day of hiking brings us down the cloud forest on a series of Inca stairs to Winay Wayna, another interesting ruin full of swallows and orchids. 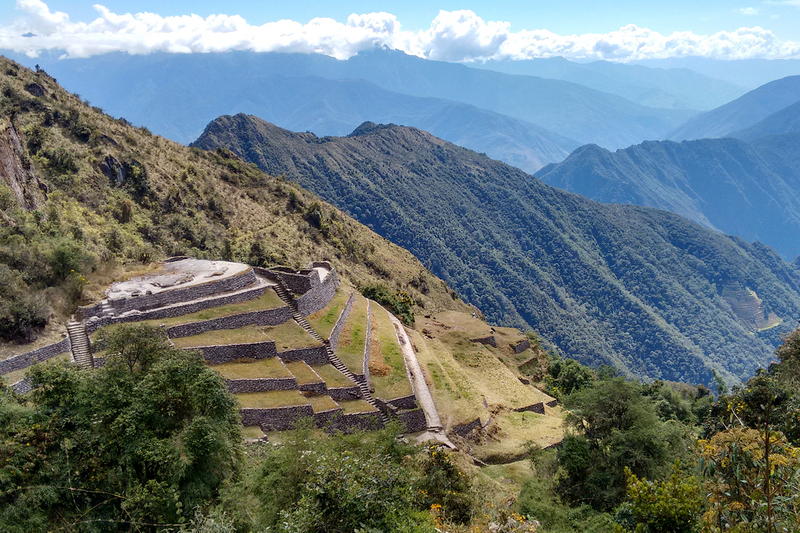 We reach Inti Punku, the gateway of the Sun and our first glimpse of Machu Picchu. We pass through the ruins and catch a bus down to our hotel in the colorful town of Machu Picchu Pueblo (Aguas Calientes). In the late morning we have Machu Picchu virtually to ourselves for a full guided tour, after which you have a couple of hours for more exploring on your own, or just collapse under a tree in the central plaza area. If you are exhausted from so much walking just stay in Aguas Calientes (Machupicchu pueblo) and enjoy its hot springs as you have a second opportunity to see all of Machu Picchu well rested the day after! After an early breakfast you can walk or take the bus back up to explore more of Machu Picchu on your own after your climb of Huaynapicchu or Machu Picchu Mountain. The first buses are available from 5:30 am and depart every 10 minutes. You can store your backpack in your hotel and make sure you get back down to Aguas Calientes (Machupicchu pueblo) at least an hour before your train departure which is generally at 6:45 pm but you should recheck this with your guide on day 4. Grab some snacks and drinks before boarding the train as the journey back to Cusco is about 4 hours long! Transfers In / Out for inca trail to machupicchu. Transportation from Cusco to Km 82/Piscacucho (where we start walking). Professional bilingual tour guide for the inca trail (English/Spanish). 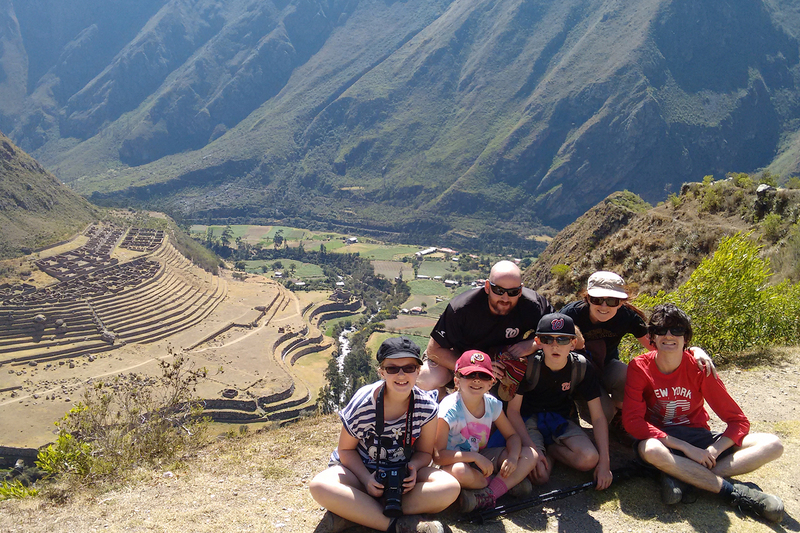 Guided visit to the Sacred Valley of the incas (for groups of 9 or more people). Entrance Fee to Inca Trail and Machu Picchu. 2nd entrance fee to Machupicchu and Machupicchu or Huaynapicchu Mountain. Bus tickets to Machupicchu Inca City and to Machupicchu town. 4 breakfasts, 4 lunches, 4 dinners and various snacks to be eaten throughout the day. Professional Cook: all our fresh vegetables are washed in iodine water prior serving and we provide only boiled, filtered or iodized water for drinking. Vegetarian food on request at no extra cost! All dietary requirements from vegans, lacto-allergies and general dislikes can be catered so long as prior warning is given when booking the trip. Porters service (to carry the tents and cooking equipment only). Drinking water along the Inca trail. First Aid equipment for trek. 1 Oxygen Tank for trek. 1 night in a basic hotel in Aguas Calientes (Machupicchu pueblo). One way bus ticket from Machu Picchu to Aguas Calientes (Machupicchu pueblo). Expedition train ticket from Aguas Calientes to Ollantaytambo. Transfer from Ollantaytambo train station to your Hotel in Cusco. Cash in local currency (Peruvian Soles) for Machu Picchu locker rental. You are required to check your backpack into a locker before entering the ruins. Student ID, (if applicable) - Please note, student discounts are given to passport holders under the age of 18. Students 18 years and above need to carry with them a valid Student ID from their school/university that shows expiration after travel dates. The International Student Identification Card (ISIC) is no longer a valid form of student identification. Please scan and email us a copy of your student ID at the time of booking to receive student pricing for applicable entrance fees and travel. Sleeping bags para el trekking inca trail. Tips are not included but it is optional. Entrance ticket to Huaynapicchu (65$) – There is only a limited space at Huaynapicchu (400 persons per day), so it is a good idea to book in advance. Water for the first day, but on the way it is possible to buy bottles of water from local families. With an ISIC card you can get a discount (20$) of the Inca Trail; you need to scan and send it to us at the time of your booking. If you are under 17 years old, you can get a discount (20 $) of the Inca trail; you have to scan and send you passport to us at the time of your booking. The Itinerary can change according to the Peruvian government, climate and health status of the trekkers. The train schedule can change according to availability of the train company. The train that we provide is the expedition train to Ollantaytambo – if someone books a train ticket in the last minute it is not sure that they can come in the same train as the other group. If you would like to change your train schedule or tickets, you have to pay more for the transport from Ollantaytambo to Cusco and for the price change of the train.